Phalkey demonstrates with hard evidence and irrefutable logic that the connections so frequently argued between the Indian "peaceful nuclear explosions" of 1974 and the early years of nuclear research were at best tenuous and at worst non-existent. The folks at the TIFR Bombay, the IISc. 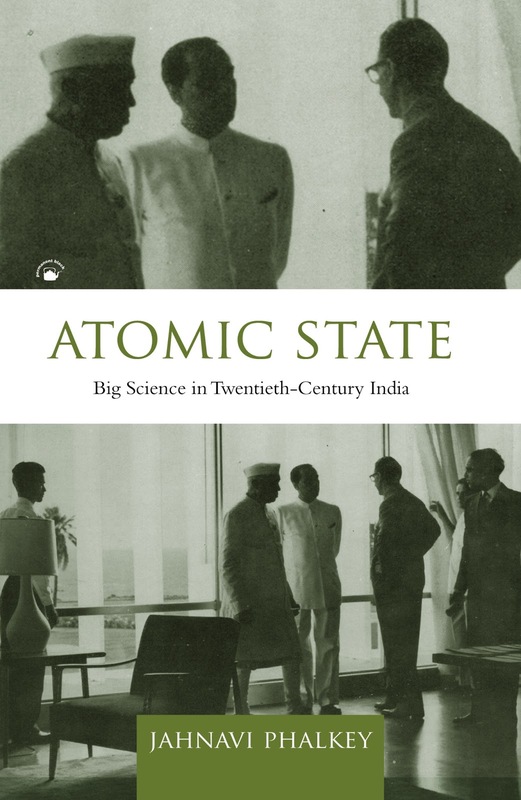 Bangalore, and University Science College in Calcutta didn't have atom bombs in their heads when they set about trying to procure cyclotrons for their labs. Phalkey says the dots connecting them with the Thar Desert explosions constitute a falsely retrospective reading. The academic term among historians for making up a story when there isn't one is 'teleological argument'. A teleological argument is a very bad thing. Phalkey shows us how bad, and does so rivetingly. So, from her book we find out a lot about C.V. Raman, Homi Bhabha (the comprehensible first version), Meghnad Saha, Shanti Swarup Bhatnagar, and others less famous; and a little bit about how historians cook up stories and, disregarding hard facts, make teleological arguments. Phalkey, broadly in line with the school of thought that includes Meera Nanda, shows science as a 'universal' pursuit much more than a culturally specific practice. Q6. (publisher’s question) Could you list a few of the books that have stimulated your ideas and intellectual directions? It is hard to identify a handful of books that have influenced my intellectual formation. Two books that made me turn to the study of Indian politics in the 1980s were Partha Chatterjee’s Nationalist Thought and the Colonial World: A Derivative Discourse and Atul Kohli’s The State and Poverty in India. I derive aesthetic pleasure from novels that are unusually structured, and speak to contemporary problems through history. Two of my all-time favourites in this genre are Iain Pears’s The Dream of Scipio and Amitav Ghosh’s In An Antique Land. This may also explain why the books that I have hugely admired, without their necessarily having influenced me in any discernible way, are Hobbes’s Leviathan, Rawls’s A Theory of Justice, and Jawaharlal Nehru’s The Discovery of India. I met Ranajit and Mechthild Guha for the first time in October 1971, soon after arriving in India as a young history student about to start my doctoral research on a history of the nationalist movement in Gujarat. Although Ranajit taught at Sussex University, where I had enrolled as a postgraduate, I had not so far met him as he had been away on research leave. Already, Sussex had been an eye-opener for me. I had previously studied as an undergraduate at London University, where I was exposed to what I came to realise was a strongly colonialist interpretation of Indian nationalism. Anthony Low – who was now my doctoral supervisor – Peter Reeves, and others at Sussex soon changed all that. My eyes were however to widen yet more on meeting Ranajit in his temporary abode, a flat in Mall Road in Delhi. Sitting in front of a shelf of the collected works of Lenin, he told me of a new peasant radicalism that had the potential to sweep aside the tired and discredited Congress regime. He urged me to abandon plans to start my project with months of archival research in the big cities and get straight on the train to Gujarat, to live there and mingle with the people in all their joys and sorrows, feeling my way towards a clearer focus to my research. The advice fell on highly receptive ears – for since 1967 I had spent many of my university vacations travelling rough in far-flung regions of Europe, Asia and Africa, immersing myself in local cultures, though superficially. Now, I had a chance to do it in a more committed and satisfying way. Before the end of that month I was ensconced in the Gujarat Vidyapith – the Gandhian university in Ahmedabad – dressed in khadi, learning Gujarati, and meeting up with old nationalists. Ranajit and Mechthild visited Ahmedabad in December, and likewise stayed at the Vidyapith. Their stay coincided with the start of the Bangladesh War, with a curfew and blackout at night, and we sat together in the darkened rooms chatting for long hours. He told me of Gandhi’s strengths and weaknesses, and what he considered good and bad history and scholarly practice. Not only did I feel inspired, but he also helped me to begin to feel my way towards a very different approach to the history of Indian nationalism. Soon after the couple left, I took another train-ride, this time on a narrow-gauge steam train that chugged through the lush countryside of Kheda District in central Gujarat, with its little fields hedged by cactus and fruit trees, and peasants with rustic carts drawn by magnificent white Kankrej bullocks. I stayed in the heart of this region – the Charotar – in a Gandhian ashram, and was taken by old nationalists of the Patidar community to meet their fellow freedom-fighters. Within less than a week I had determined the subject of my research – it was to be that of the peasant nationalists of Kheda District. I could never have grasped the spirit of such a project sitting in an archive. In this way, I found my subject. Although the Patidars on whom I now focussed were – I quickly found – at an opposite pole to any revolutionary class as envisaged in Maoist theory, they were at least peasants, and peasant studies were about to burst on the scene as a major academic topic. Ranajit had facilitated my being in the vanguard of this new approach, and soon I was to go to go on an engage with a much more obviously subaltern group, that of the adivasis of the hills and forests of the Gujarat borderlands. Without his initial intervention and ongoing inspiration, none of this would have happened in the way it did, and I would have been greatly the poorer for it. This I can never forget. Nobody walks the thin, sharp line between being an iconoclast and becoming an icon with greater flair than Ranajit—my cherished mentor and dear friend. To change the self-understanding of a discipline by radically rethinking its archive of political agency and its narrative flow of events demands something more than scholarly courage and political commitment. Such historic acts of the interpretive imagination unlock frameworks of disciplinary legitimation—the order of things—and disclose the power of ideas and actions that have been attenuated or camouflaged or sublimated in their struggle to survive the onslaught of hegemonic or dominant forces. To retrieve such acts and ideas into the annals of history demands a rare kind of charisma. And it is this quality of charismatic authority that drew the most gifted historians of India around Ranajit. The rest isn’t just history, it is Subaltern Studies. I owe Ranajit much more than any scholarly tribute could convey. Ranajit ushered me into my academic career. As soon as my appointment at Sussex was announced, Ranajit invited Jacqueline and me to lunch in the warm and beautiful home Mechthild and he had made in Brighton. I had only ever seen Ranajit on British television trouncing Mrs. Gandhi during the Emergency. I was quite unprepared for the pastoral pundit who revealed himself while walking us meticulously through Mechthild’s magical garden of herbs and vegetables. At lunch I understood why terroir mattered so much to Ranajit—wines were matched with seasonal dishes of great delicacy and the freshest of flavors. All this indulgence and benevolence caused me to relax more than I should have because I was also quite unprepared for the mischievous irony that Ranajit was about to unleash on that occasion, and on many other memorable occasions since those early years. The resonant voice becomes a tad lower and smaller, the face tilts, and the unusually expressive eyes become ever so slightly hooded: “You see, unlike you, I am no ‘the-o-rist.’ You use these sophisticated concepts, make all these complex speculations and references… I belong to another generation, a much more straightforward, simple intellectual tradition…” Not to accept Ranajit’s playful provocation is to forego one of the most stimulating and dramatic intellectual experiences you are likely to have. Never resist the hypodermic jab delivered by our Ranajit; the flesh may quiver but it immeasurably increases the life of the mind. Never fail to listen carefully to “the small voice of history” (to cite one of Ranajit’s signature essays) because when he speaks, the sober surfaces of scholarly sententiousness are swept aside and a Nietzschean flame singes all that is obvious and otiose. My dear Ranajit, I lift a glass to your health as I did in Vienna some years ago, toasting you with my favorite Muskateller. You drank graciously but not as fully as I had hoped. The next time we lunched, you made it plain: “No more Muskateller. Try my drink, Poire Williams, eau de vie.” So Poire Williams it was, and Poire Williams it will be when we meet again. I wish you and Mechthild many years of companionship. I wish you both many more unread volumes, and many more books as yet unwritten, and many more pieces of music as yet unheard. I wish this for you both as I wish it fervently for the rest of us.